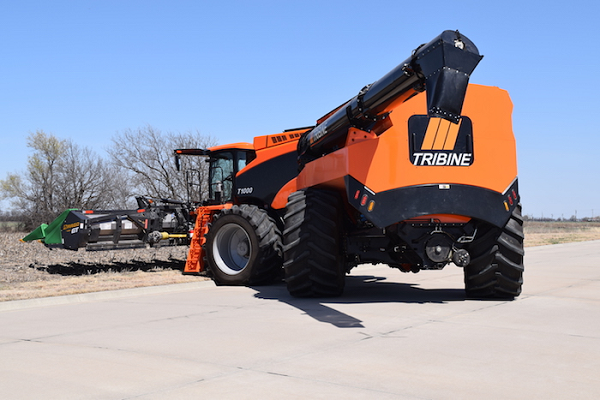 The Tribine harvester first got the industry talking in 2013 when the prototype was first introduced in Kansas City at AG Connect. The Tribine provides two traditional functions, threshing and separating, plus the third function that involves a grain cart transporter. The Tribine was created to address several issues facing today's farms, such as the impact of labor shortages and reducing compaction. It brings together several functions for increased efficiency and productivity. In October, Tribine Harvester LLC announced James Shurts had joined the company as chief operating officer, responsible for the company's day-to-day operations including engineering, production, marketing and sales and finance. After several years in research and development, the company is ready to move to the next stage and begin production that will get the product in the field with customers. "We're at a critical stage right now. The team has spent years on R&D. That's their mentality - refine a design, get it perfect and continue to evolve technology into a solution that fits these needs. That's why I've come in," Shurts says. "Coming from the industry background, we've gotwe have to continue that spirit of entrepreneurship and that mustang mentality. But, we've gotwe have to get ready for production. It's time to switch gears as a company. We delivered the first unit a little over a month and a half ago, and the second unit is being delivered in mid-October. So, that's a huge, fundamental shift for our team in a good way. "It's time to start locking down designs earlier and then getting ready for a larger volume of production. We have targeted objectives and sales that we have to deliver next year." In addition to preparing the company for production, Shurts says the next big initiative is Tribine's service and support strategy. "This is a direct to customer model. And we do not want to change that because we don't want to be a giant OEM," he says. The amount of dealer consolidation that has taken place in recent years has had a negative impact on the level of service customers are given, Shurts says. "For the farmer in me, that's a pain. That's frustrating. The level of service is going down. So, we're going to maintain going direct to customer," he says. How does service and support work without a dealer network? Shurts says they have a plan in place and will need to ensure parts are staged in the right places. Tribune has two bases of operation, one in Logansport, Ind., and one in Newton, Kan. Each of those locations will have employees dedicated and assigned to the early deliveries. "In essence, when you by an early Tribine, you get a Tribine employee," he explains. "That's how it's going to start. It's going to be that boutique, very custom, intimate experience because we have to stay with it." While the company is ramping to move the product into production, its sales goals for the year ahead are modest. Shurts says they want to sell less than 15 units in 2019 and build less than 20. "We'll have a very targeted second round of customers," he says. "In essence, when you by an early Tribine, you get a Tribine employee. That's how it's going to start. It's going to be that boutique, very custom, intimate experience because we have to stay with it..."
So who is that targeted customer? Shurts says it starts with someone who understands their capital limitations and who has a genuine concern over the compaction associated with running multiple machines and grain carts through the field. He also says the customers they target have more sophisticated operations. Shurts adds they aren't focusing on the number of acres a customer operates at this point. "If we can demonstrate a profit gain with the Tribine then the farm is a candidate regardless of size," he says. "Tribine addresses the concerns of capital, labor shortage and compaction from multiple field passes. An ideal fit for a Tribine is a farm with four combines (class 8 or 9) and two tractors with grain carts (1,000 bushels each). Two Tribines (class 11) can effectively replace the four combines and at least one tractor with grain cart. The farm can then maintain the same output capacity while eliminating the need for two combines and one tractor and grain cart. This eliminates a significant capital load, three operators and compaction associated with the extra tractor with grain cart." In addition to the benefits of reducing head count and eliminating a tractor and one or two combines from capital expenses, Shurts says they've proven a 2-3% gain in yield just from reducing compaction. "Within one year it'll pay itself back," he says. For the first two years of production, Shurts says Tribine will focus heavily in Kansas, Nebraska, Indiana and Illinois. The primary target is within a 250 mile radius of their Newton, Kan., Location, which is in just north of Wichita. "Then as we get toward the tail end of year one and into year two, we'll expand that circle," he says. "And then the second circle is Logansport, Ind., which is northwest Indiana. We'll have the same strategy there. We'll target around those base operations." Tribine's longer-term strategy will heavily target the Corn Belt. By 2020, those two circles will intersect with each other in terms of where the company will market the product. Shurts says the market will eventually dictate a need for variations and different models. He says it's a product that could serve South America, but it would need to be a variation on the product here in North America. Likewise, it could serve Europe, but would need to be smaller, more compact. "Tribine will eventually be a combine built for nearly all markets. For 2019 we are primarily focused on the static farm operations. This strategic focus will ensure we exceed customer expectations for aftersales support," he says. "We will continue to expand our support network and coverage then look to grow into the custom harvester segment. We see the Tribine as being a great fit for the custom harvester market in the future." "Then we'll focus on the next tier of farmers who don't need a class 11, who need a smaller unit , but the same industrial concept of large carrying capacity and large throughput, but need it in a smaller or a more price-sensitive point." Shurts says it will be 2020 before Tribine starts to explore different model options. "We want to ensure we're very specific and very good and that all these initial customers have nothing but positive comments and success," he says. "If you look at some past entries into this market, if you go too big too fast, you can't support it. Your distribution doesn't fit the customer's model or it's too big and too clunky and it can't evolve." As Tribine gets into years three and four of production and early customers begin to look at replacement units, the question of used Tribines comes up. "Just like any combine, that magic number is 1,000 hours before it needs significant rebuilds. Same strategy. We're going to be equivalent to that. But, with these larger farms, you can look at this anywhere from 300-500 annual hours, and our target is always that first customer. They are typically holding an asset for 3 years," says Shurts. "So, you can anticipate that the used markets will hit that 1,200-1,500 hour mark, and then you look at second use life. That, they understand it's a used product. It's going to come at a used price, but it's going to have advantages of the features and capacities and capabilities, just at a different maturity of the product." Shurts says it's already something they are thinking about and are developing a strategy. "We have a Tribine remanufacturing strategy. We will support these second use customers directly from our facility. We won't just sell it and forget it," says Shurts. "We'll support those first customers, and even moving forward with basically trade-in strategies, to give them adequate pricing, and then provide a second use strategy for that product. Again, it goes back to other entries. We won't let it just go to auction." Shurts adds the intent is that they'll already have identified a buyer for the used unit, which they'll run through a remanufacturing process and recondition it to like new. That unit will have its own sets of warranty and support, he says.